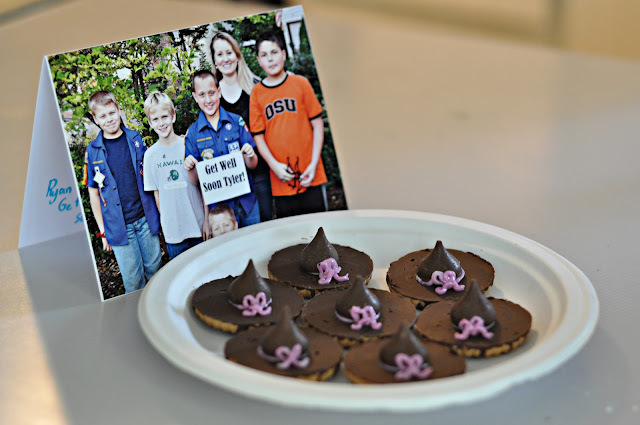 I'm a Cub Scout leader and one of our little Webelos has been sick for a month. This is my go-to treat during the month of October, so hopefully these tasty little hats will let our dear Webelo know we want him back soon! I have a post about these same cookies already written! It's going up on Tuesday. I hope you don't mind if I link yours to it as well. Thanks for linking with While He Was Napping! I hope you'll come back next weekend. So cute and simple! 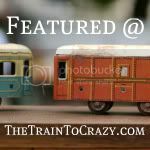 And I loved your guest post over at Tatortots and Jello! You should come link this to Making It With Allie! Adorable!!! So glad I found you through the link party @ I Heart Naptime. They look delicious, such a sweet idea! So cute! My kind of style - sweet and simple! Thanks for sharing! I love those cookies - I think even I could do those. I am also going to try those spiders. I wanted something exactly like that for napkin rings. I think those would work, but I don't think I'll have time to get them done for thise year. But I'll have them in the works for next year's Halloween! Great post. I am going to do this for our Halloween party! Too cute! Following you from Making Monday Marvelous! These are so cute I can't stand it -- definitely saving this away in my idea file, thank you!! I made those a few years ago for my son's Halloween party (with red ribbons)...people raved not realizing how easy peasy they are to make!!! I would LOVE for you to link this recipe up to my HALLOWEEN linky party this week! So cute! I love the semi-homemadeness of it all! I hope your scout feels better soon. I am a den leader of the littlest guys. What fun! Oh my, I remember making these for my daughter waaaay back when! Still cute today! Now I can make for my granddaughter. These are so adorable! I can't believe I've never seen this before. The tiny bows are such a cute touch. Visiting from A Crafty Soiree. What an awesome idea! Even if Betty Crocker made it up - you made it fun for your kids! These are so cute and the best part-EASY!! Very, very cute and they look yummy! Ok, I have GOT to try those! They look so cute & tasty. Not to mention easy to make...lol :) Thanks! these are too cute!! I love it!! These turned out so cute, thanks for linking up to Sister Sister Sunday. 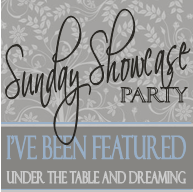 We will be featuring your blog on Sunday, make sure to check it out! I featured you and your cookies on my blog today -- come see! How cute! Your so creative! very fun! My sister and her kids make these every year, I should really start doing it myself! Thanks for linking up to Topsy Turvy Tuesday's! So cute! My mom used to make the same ones. 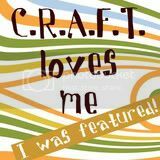 Just wanted to let you know that I “ Featured” you on Santa’s Gift Shoppe Monday Blog Hop today for your great project & inspiration! Thanks so much..
Super cute I need to try these... I have similar "prowess" when it comes to cookie. 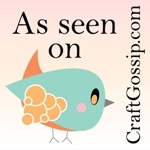 Thanks for joining us at A Crafty Soiree. Hope to see you Thursday. These are so fun! Thanks for planting your creative seeds at Plant a Punkin Seed Party!